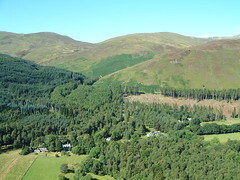 Invervar is the first real settlement that is a small community in the glen. There are ten houses. There is a mix of private and housing association properties. Most are occupied full time though there are a couple of holiday or weekend homes. The old school building was converted into three houses in the early 1990s. There is a small car park which is used by walkers climbing on the circuit of four Munros above Invervar. The tracks from Invervar lead up into the hills for walking and stalking of deer, and down to the river where there is a good salmon pool. The track to Dericambus turns off south at Invervar to cross the river at a good bridge. It gives access to the properties at Dericambus and Inverinian. The population of Invervar over the past two hundred years has changed in a couple of diferent ways. Firstly it has reduced, in line with the general rural depopulation that occurred as part of the industrial revolution, reforming of agriculture, and later economic and social changes. Secondly, the age and mix of the population has changed. At one time Invervar supported a small school, with pupils coming from nearby within the glen. But now there are few children and the glen only supports one small primary school at Bridge of Balgie. The resident population is older. In very recent years there have been a couple of births at Invervar so this gives some hope for the future. Invervar was an industrious community in the past. The Invervar Burn provided a source of water and power. 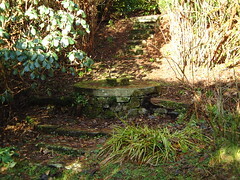 The stone building at the entrance to Invervar Lodge is the old smithy. At one time there was also a grain mill and a lint (linen) mill at Invervar. We can deduce from Duncan Campbell's account that grain mill shut down sometime between about 1840 and 1880. Through the gate to the left of the smithy and a short way up the track is the circular building of the old Lint Mill. The lint mill was used to mechanise the production of linen, produced from flax grown locally. This industry died once cheaply imported flax was avaliable and the industrial revolution got into full swing. 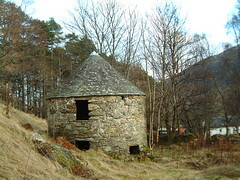 The lint mill was built by Ewan Cameron of Lawers in the late 1700s.